Matthew 7:16-20 You will know them by their fruits. Do men gather grapes from thorns, or figs from thistles? Even so, every good tree bears good fruit, but a corrupt tree bears evil fruit. A good tree cannot bear evil fruit, neither can a corrupt tree bring forth good fruit. Every tree that does not bear good fruit is cut down and cast into the fire. Therefore by their fruits you will know them. Most people reading this passage tend to focus in on the fruit that is produced. Okay...But a closer look will reveal that the Lord is really focusing on the tree. The fruit merely demonstrates the quality of the tree. We have all encountered this: there are trees whose fruit is healthy and delicious, and there are trees whose fruit is scarcely edible, or even useless. The fruit doesn't make the tree -- the tree makes the fruit. A tree that produces good fruit is firmly rooted in soil which provides adequate water and nourishment. Likewise, those of us whose lives are rooted in and dedicated to Yeshua produce good fruit. Others who try to produce good works for "religious" reasons, or to prove or approve of themselves, may produce fruit, but it will be much inferior. 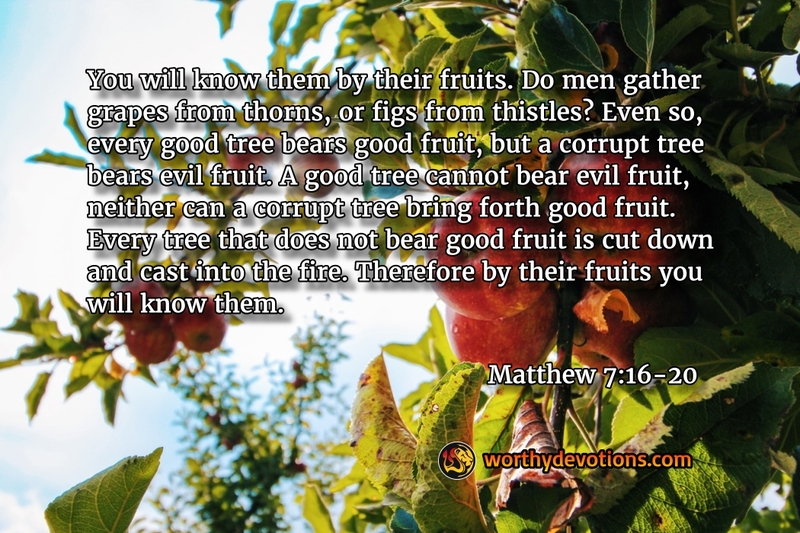 When our focus is on Yeshua (Jesus), and our lives are centered in Him, the fruit we produce will not be from self-effort, and its quality will be excellent...because it is simply the produce of a good tree. So, stop trying to produce good works in your own strength. Just tap into the Source of your life, Yeshua, allowing the sap of His Spirit to flow through you – and then watch what GREAT FRUIT He is continually able to produce! I'm hungry! Where's the fruit? !